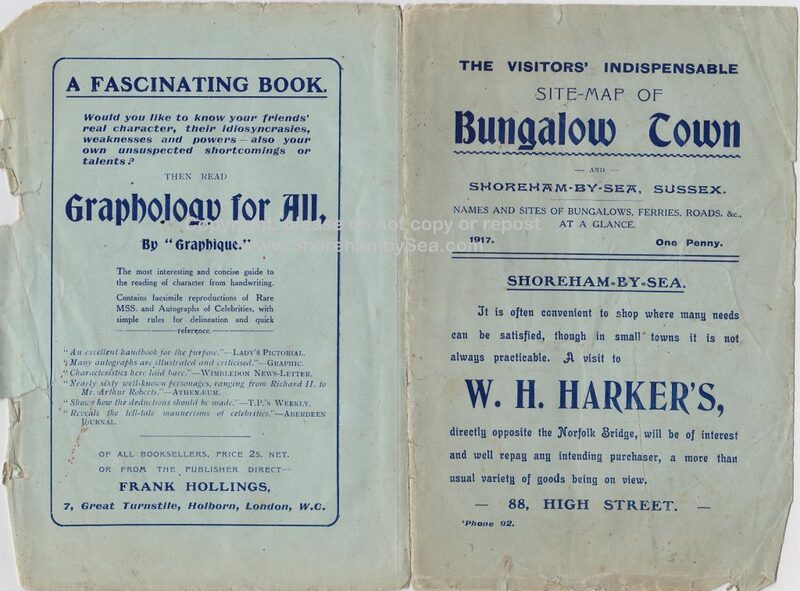 Amongst photographs recently found in part of the collections of the late Shoreham historian, Michael Norman, is one noted by him on the reverse ‘First bungalow on Shoreham beach c.1890.’ There are no other notes at all concerning it and curiosity prompted an attempt to find out more. 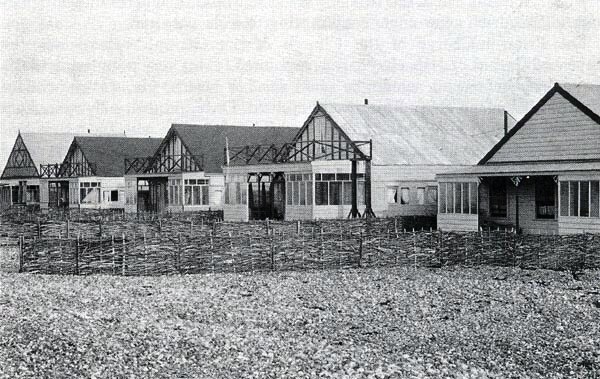 Before the bungalows arrived the chemical works, cholera hospital, coastguard station, and a few boat and fishermen’s huts were about the only buildings on the beach. 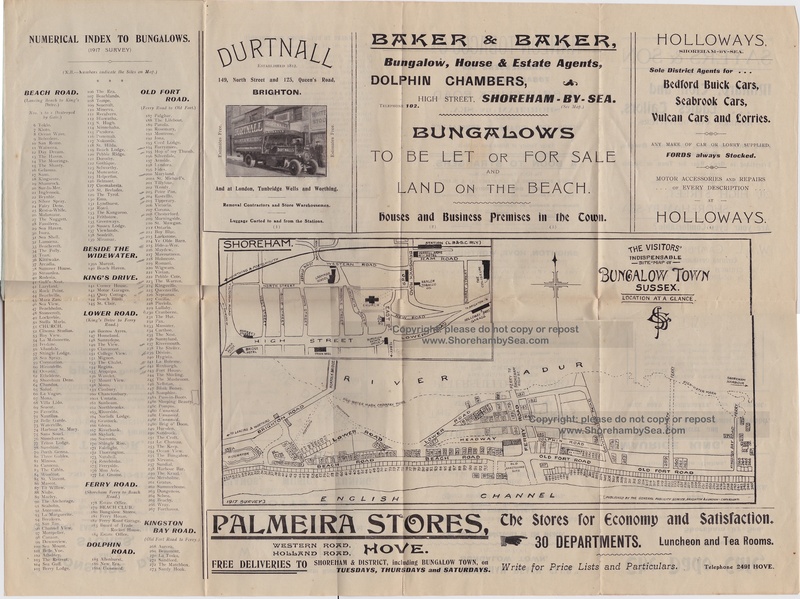 The location of the earliest bungalows can be seen on the 1898 Ordnance Survey map. 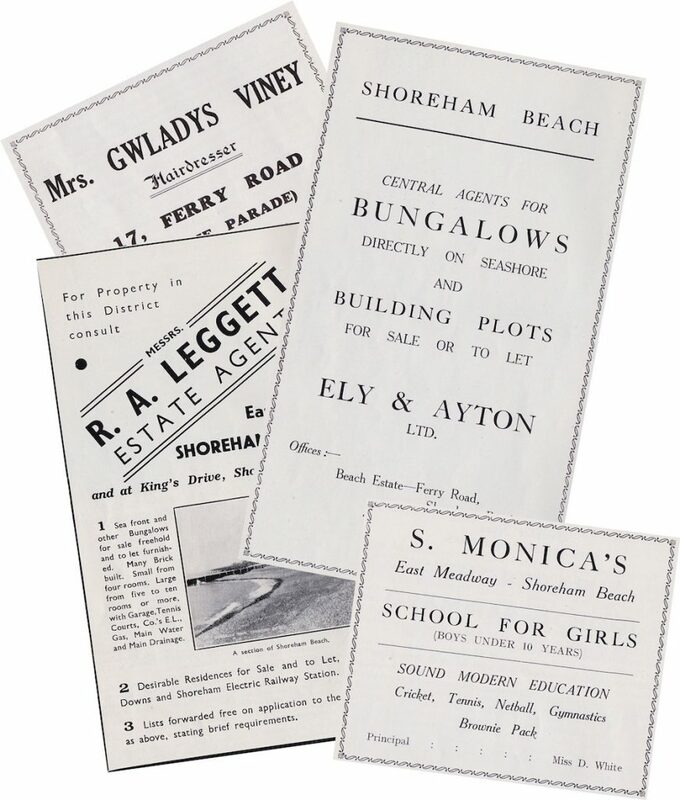 Matching this to the 1930’s Bungalow Town map and lists shows that these first bungalows were named, from west to east, Kittiwake, Arcadia, Struan Lee, Rhodesia, Lazyland, Sea View, Sea Spray, Coronation, Shoreham Dene, Waterville and Canaan (the empty rectangles were plots for later bungalow to be built on them but some don’t seem to have materialised. 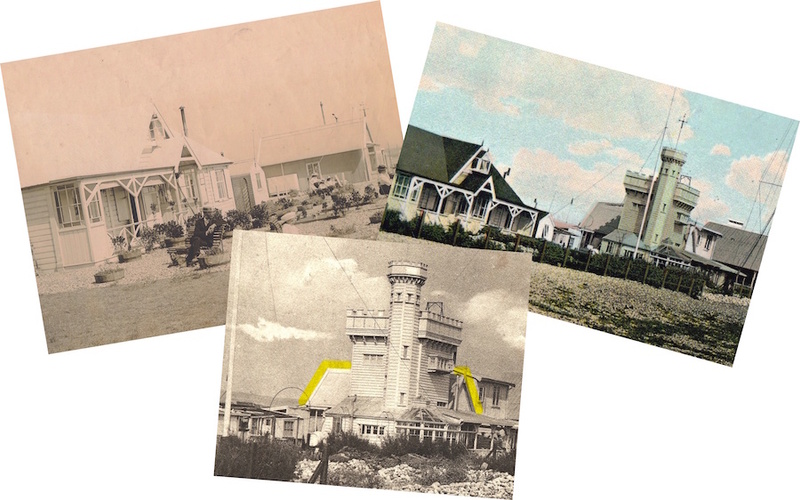 Photographs and postcards of these first bungalows in their early years are scarce but there are a few. The most westerly of these bungalows named Kittiwake was sited on the beach just below the eastern tip of Widewater. It only survived until 1911 when it burned down and was rebuilt. Beyond it in the distance is the dark roof of Straun Lee and the castle-like Rhodesia. The next photo takes us a little further eastwards. It is an older image than the previous photo, somewhat over exposed, shows Struan Lee in its earlier, smaller form and beyond it the plain bungalow that preceded the Rhodesia rebuilding. 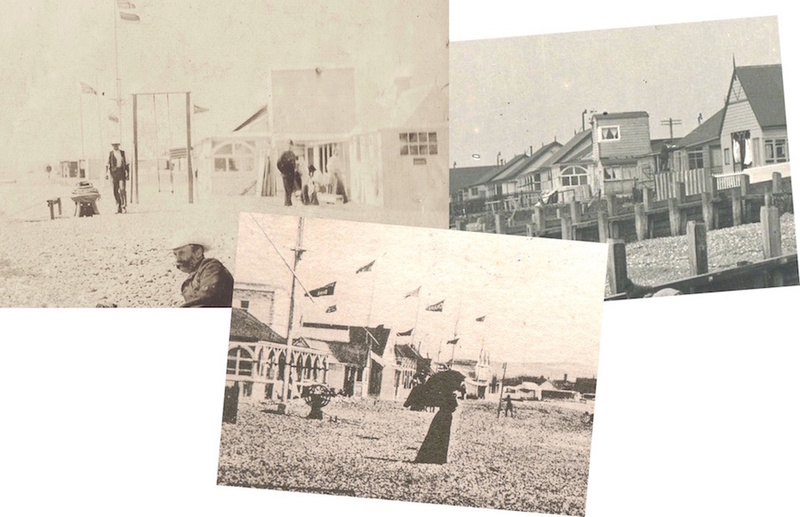 The later photo alongside it is from a hand coloured postcard showing Struan Lee with a taller roof and extension of the decorative porch supports to the right hand side. Behind stands the impressive Rhodesia but only a few years later it became yet another Bungalow Town building to be destroyed by fire. 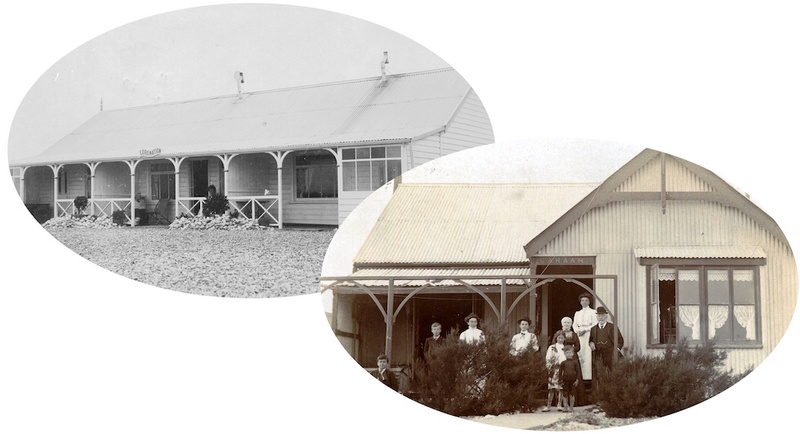 The lower photo shows how the original bungalow was incorporated into the new building. Landmarks, background scenery, other nearby buildings, flag poles etc., can be useful in identifying individual bungalows and for this exercise beach capstans used by the local fishermen also helped. 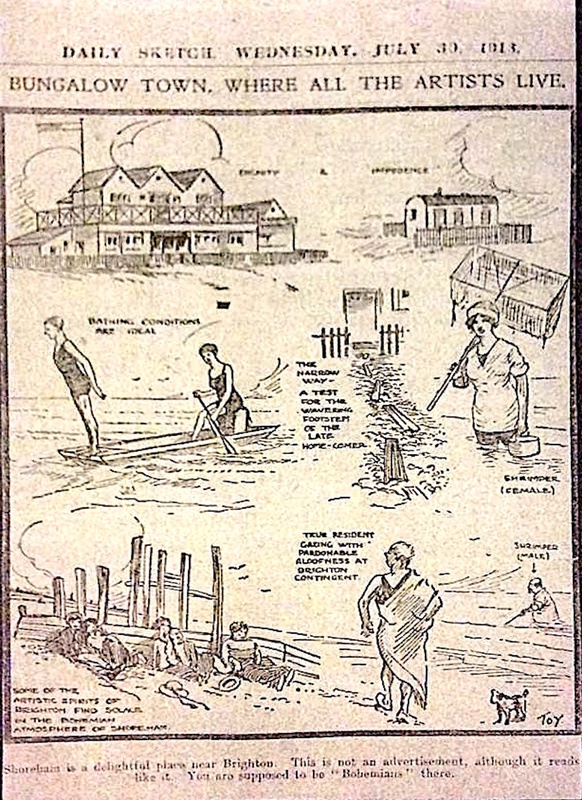 There were two capstan positions on the beach that we know of and these are shown on the 1912 Ordnance Survey map. 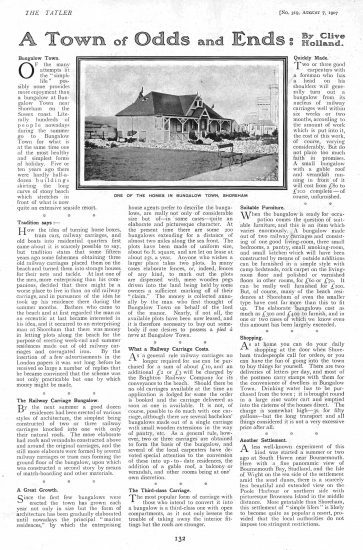 One was near Sea Spray bungalow that had been built in 1893 by owner Tom Lee, one of the first permanent residents of Bungalow Town – he most likely built Coronation next to it as well as he is recorded as living there by 1911. 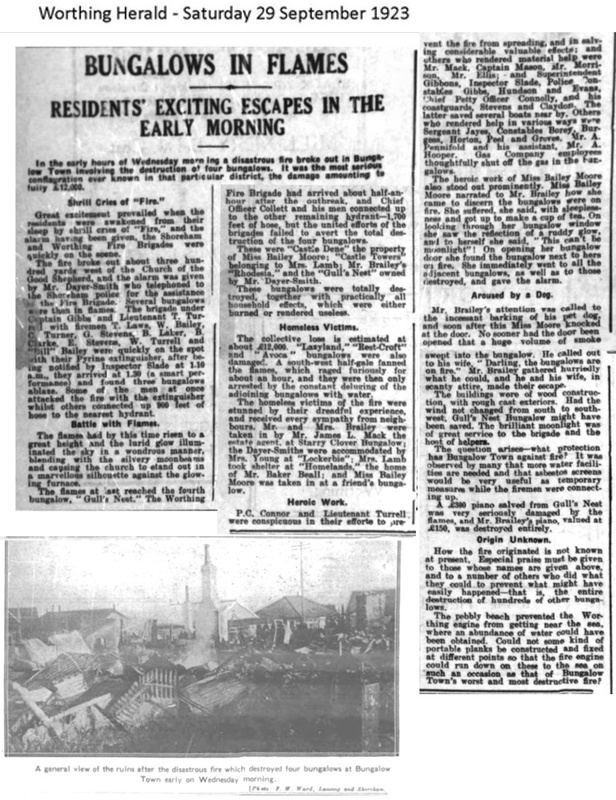 The photo top left (again somewhat over exposed) shows in the background the unmistakeable dormer and conservatory window of Sea Spray bungalow alongside a much later photo of the same building. The dormer in the older photo looks to be in the process of being added with timbers on the ground below it ready for use and next to the walker striding towards the camera is the capstan. A later photo (below) show this capstan (or a replacement) repositioned at the west side of Sea Spray but fitted with wheel-handles that indicate an horizontal drum winch generally known as a ‘crab’ capstan. 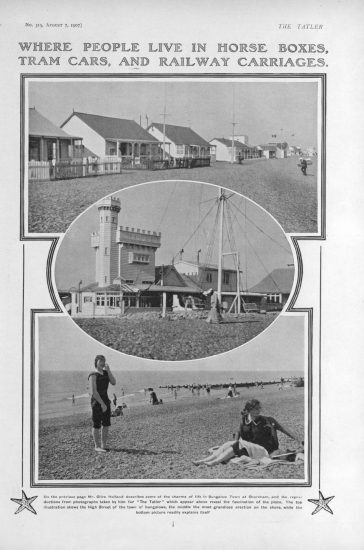 This photo (1) must be one of the oldest beach photos and shows one basic bungalow with, in the distance, two railway carriages surrounded by picket fences. In the far right of the photo another capstan can just be made out. 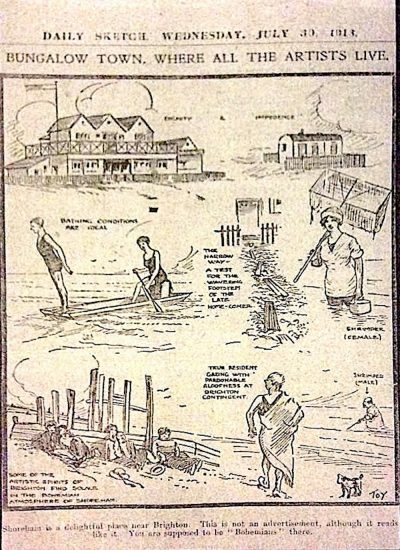 The 1912 map confirms the second capstan as being close to Shoreham Dene bungalow so could this be that bungalow in its original form? 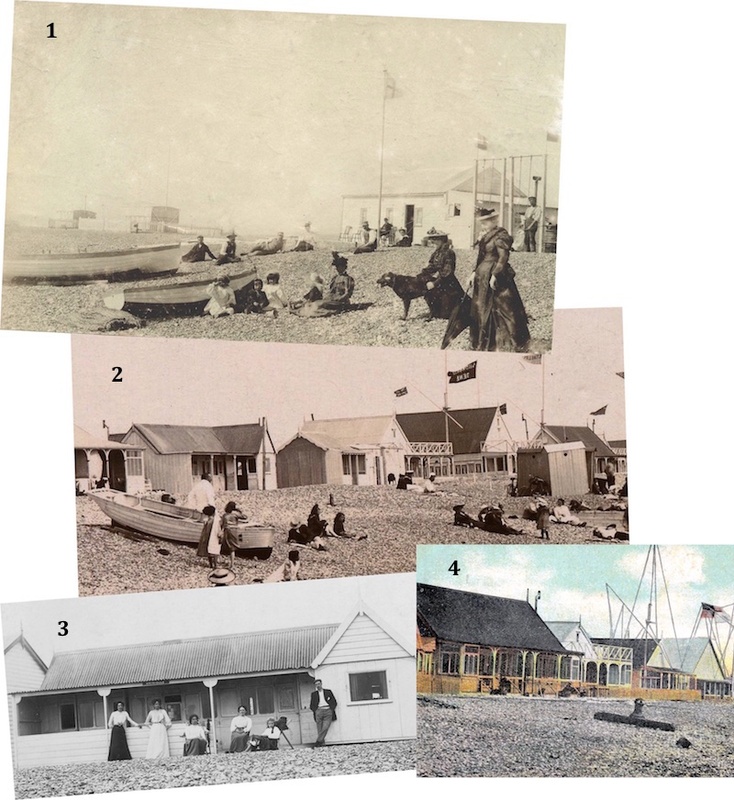 A study of the photos taken in subsequent years suggests that the closest match to the configuration and spacing of those three is photo (2) showing detail from a larger image of the bungalows near Shoreham Dene but taken from the opposite, western, side. 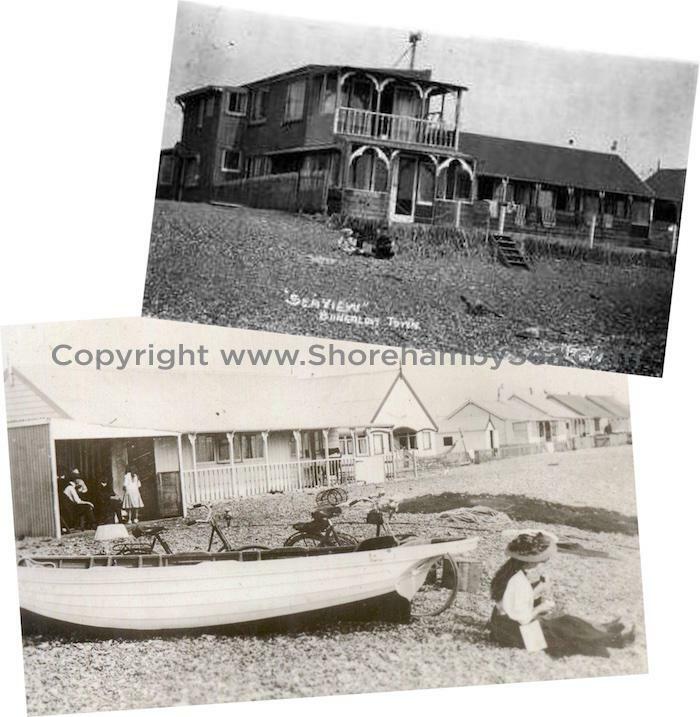 Shoreham Dene is the one behind the two bathing huts and like the bungalow in the older photo is also side-on to the beach. The simple bungalow in the centre is Salopia and the other to the left of it is Hirondelle, both in the same postions as the carriages in the earlier photo but now without their picket fences. Each of them contains one of the railway carriages and one can just be made out in the latter. 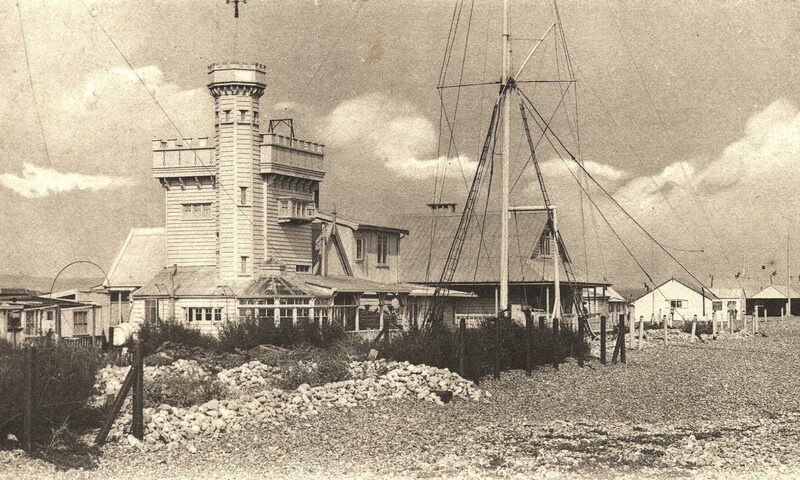 Photo (3) is a head-on view of Hirondelle showing the carriage more clearly and next to it (4) a hand coloured post card providing an unobstructed view of Shoreham Dene after the roof had been extended to include a porch. 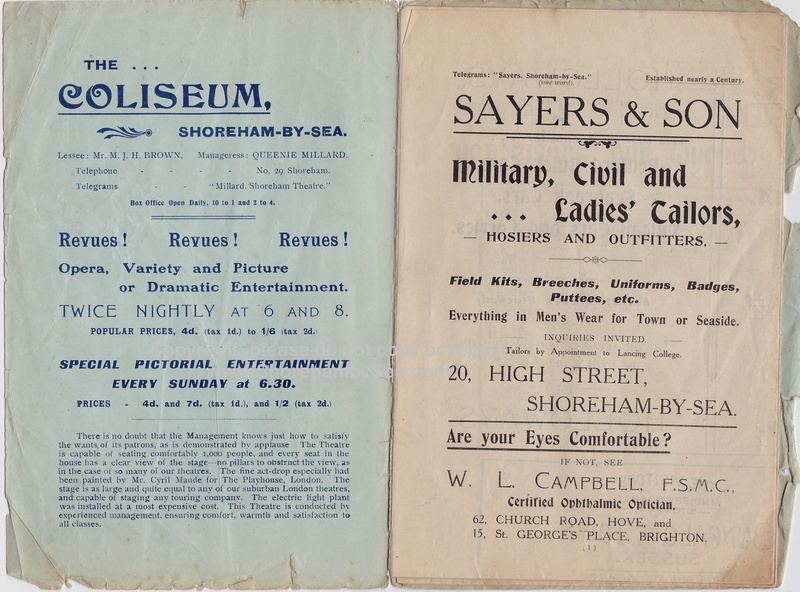 Famous music hall artists and other entertainers provided the most influence in popularising the attractions of life in Bungalow Town but 1930’s local historian Arthur Wilde reckoned Shoreham’s oyster merchant and fisherman Sam Maple was the true pioneer. Each fishing family had their own stretches of beach where they kept their boats and fished from. 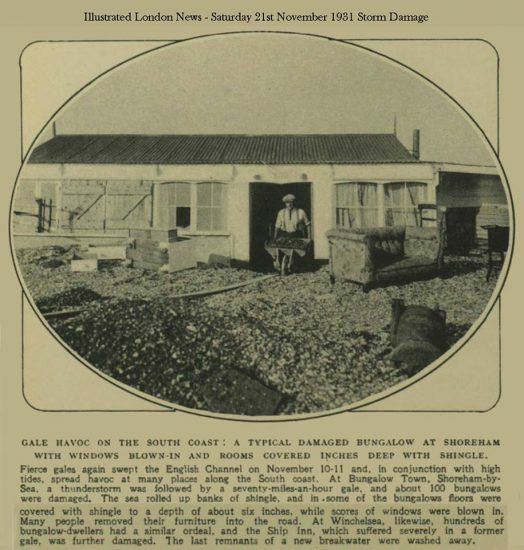 Wilde tells us that in 1879 Sam had a railway carriage towed over the river and sited on the Beach for use as storage for his fishing equipment but also as a bathing hut. 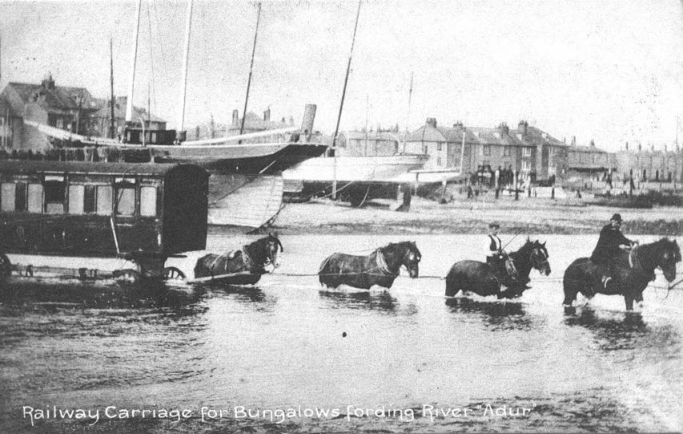 This carriage was later included as part of the bungalow Sea View that we know, from old directories and maps of named bungalows was located on the beach at the spot just below where the Church of the Good Shepherd was subsequently built. 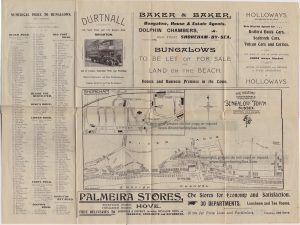 Sea View was later split into two properties. 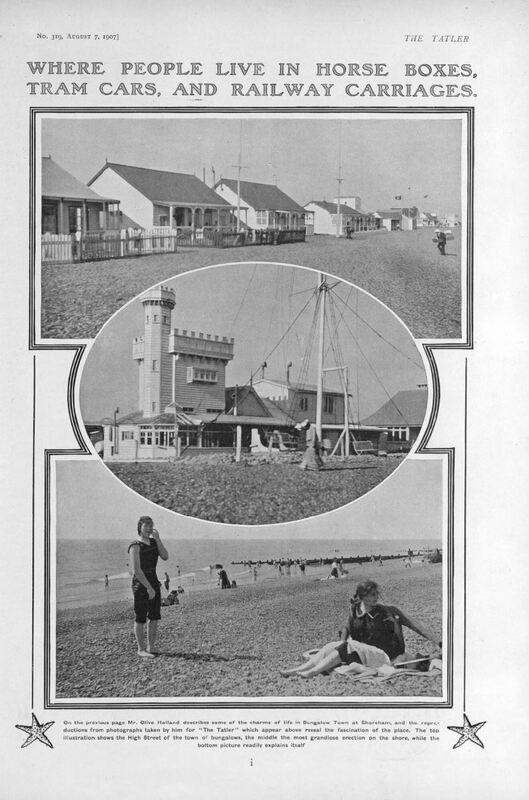 The western half of which was built up to two storeys retaining the same name and the eastern, single storey half renamed Beach Court. 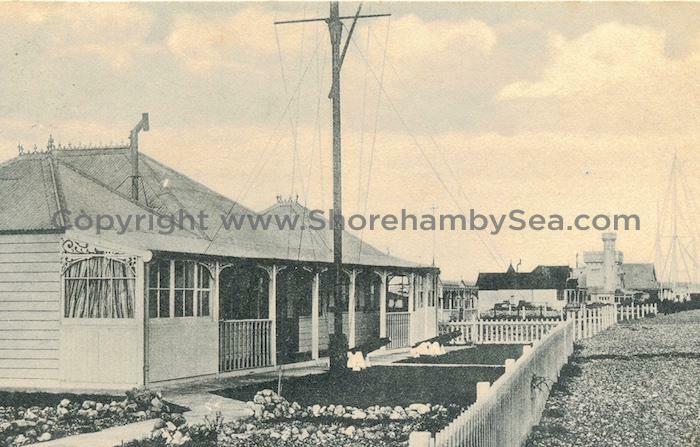 Below – Sea View as it was with the single storey shed-like side extension. 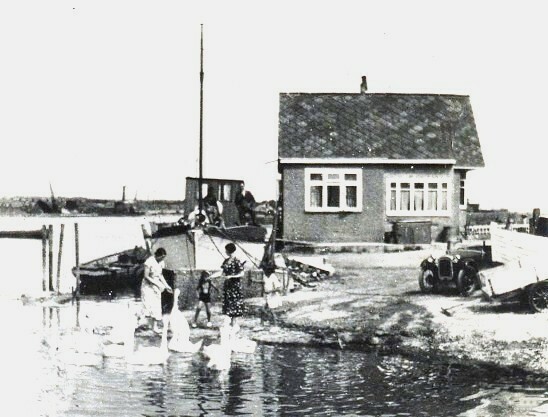 Above – the later semi-detached building with the renamed Beach Court on the right. Returning now to the question of Michael Norman’s photo. 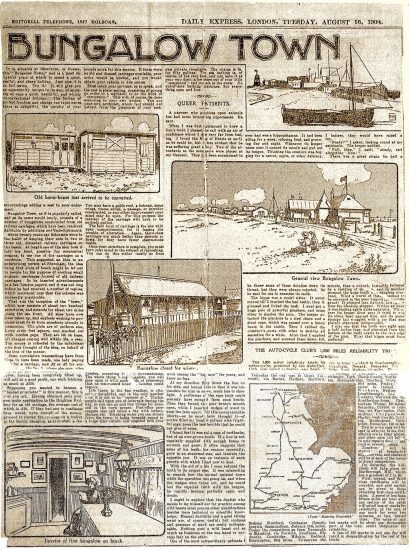 This shows (below) a Victorian railway carriage on a shingle beach with the sea behind. A good quality hipped roof has been added with a small decorative dormer and gable ends. 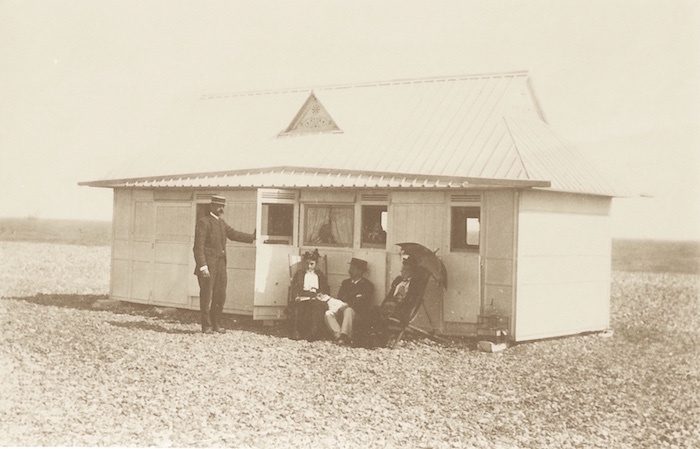 A moustached man holds open one of the doors and, with typical Victorian attitudes, three others (and a bird in a cage) shelter in the shade from the sun. The photo provides no other clues as to the location. The carriage is of a type seen in many Bungalow Town photos. 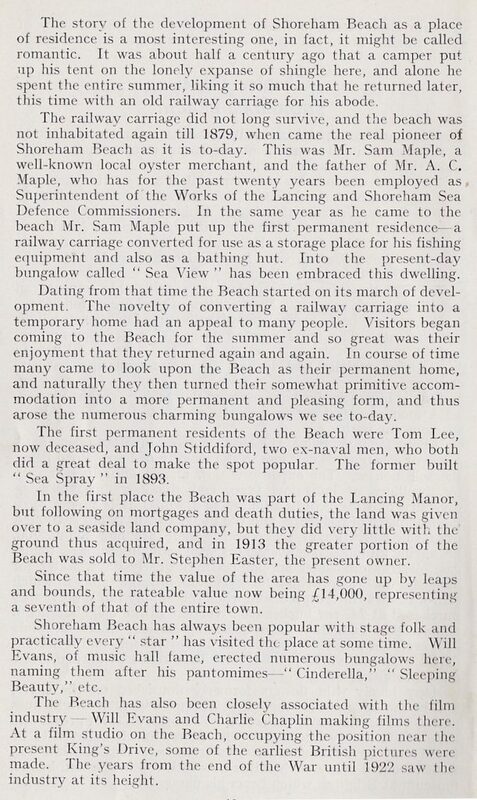 The individuals have so far not been identified – were they the Maple family or the next known occupants the Havindens who were there in 1914 and may have been responsible for developing it? 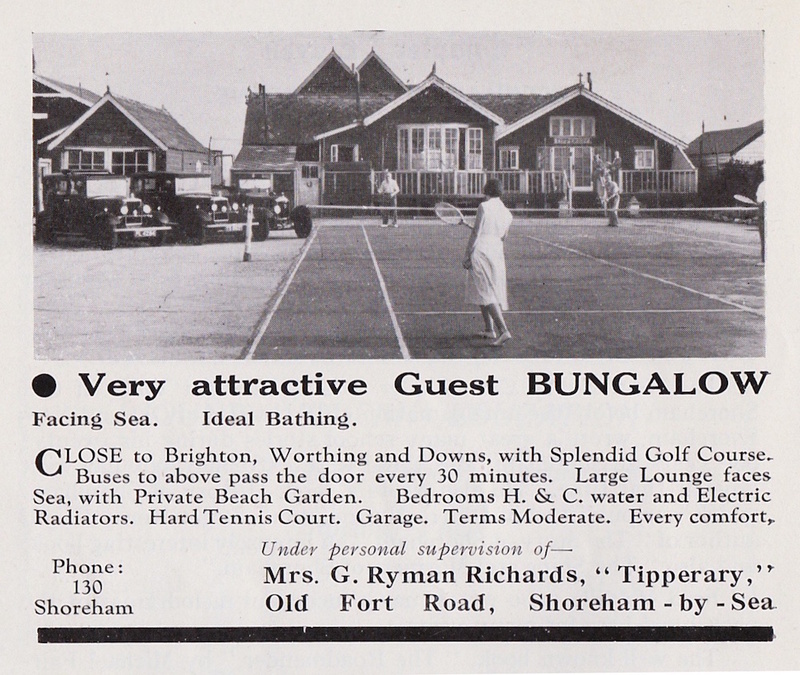 Could this really be the original Sea View, the first bungalow in Bungalow Town? If it is, its appearance as shown here didn’t last very long before it was completely covered by the enlargement work that was to eventually evolve into the two, semi-detached properties. Michael Norman was known to be a stickler for historical accuracy so it is most unlikely he would have made the notation on the photo’s reverse without good reason. 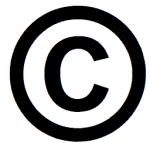 However, there are no other records in this part of the collection to confirm that. 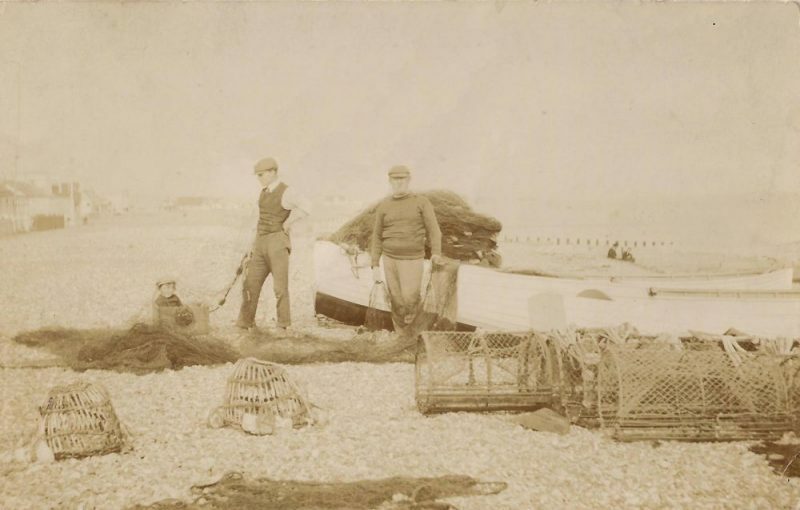 The original collection was considerable, a priceless record of Shoreham’s past but was broken up and sold off after his death. 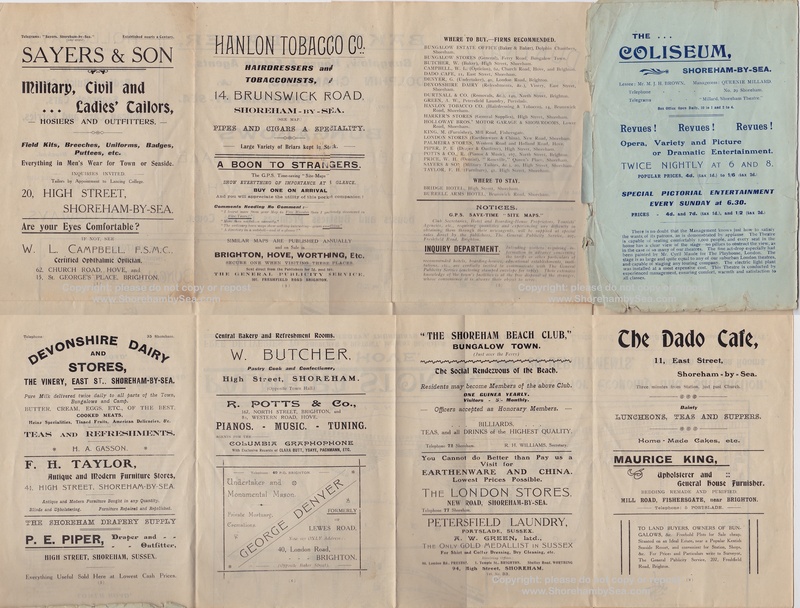 Perhaps the answer still lies somewhere amongst the other surviving parts of the collection? 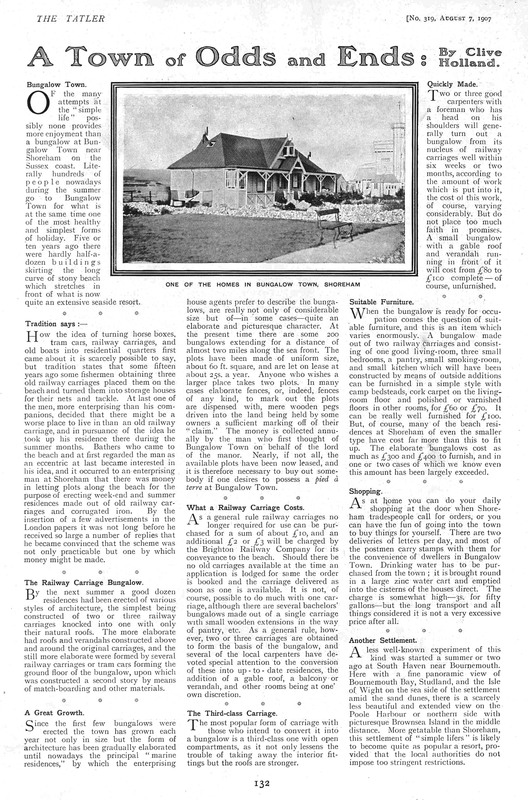 One final aside concerns the Maple family who were to be further involved in Bungalow Town’s history when Sam Maple’s son, Arthur, became romantically involved with near neighbour Agnes Rhodes, a widow who owned and lived at ‘Rhodesia’ – their story and that of the impressive castle-like ‘bungalow’ is covered in the separate article Rhodesia – a special ‘bungalow’ http://www.shorehambysea.com/rhodesia-special-bungalow/ Arthur was later to become the Superintendant of Works for the Shoreham Sea Defence Commisioners. What are these structures on the beach near the foot of Ferry Road? Changing huts? 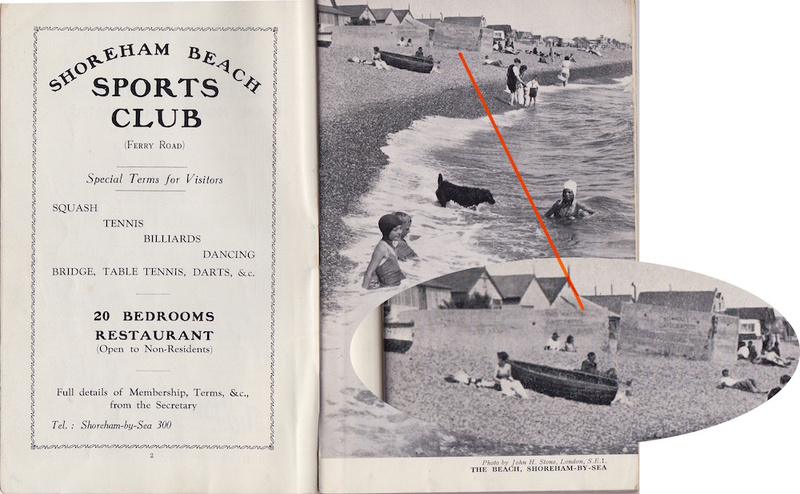 The writing on the sides is not legible and the guide has been noted ‘1938’ by hand on the cover and if so it was surely too early to have been air raid shelters? 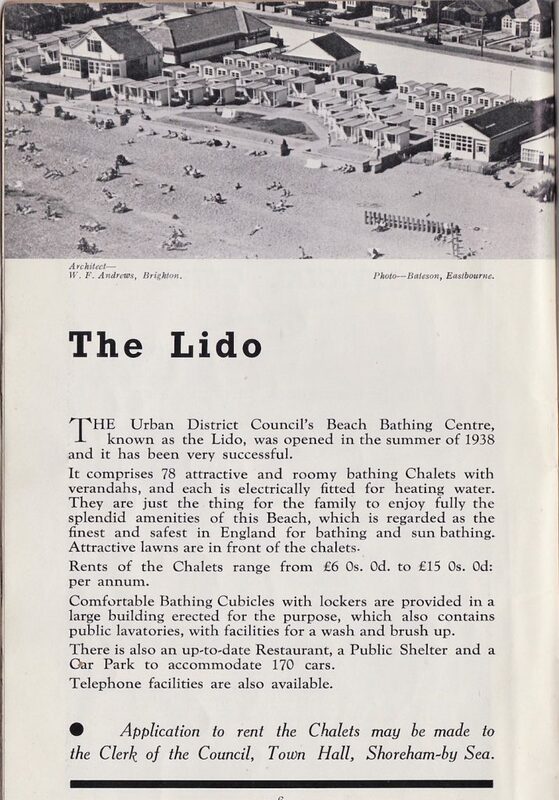 This well taken photo shows the Lido to have been quite a smart looking facility in its time.